Please join us for The Boston Football Rally Party and Freedom Rally Afterparty! Come to this amazing party which will include football, socializing and networking, educational opportunities and more! This is the Offcial Freedom Rally Afterparty in cooperation with Sensi Magazine. 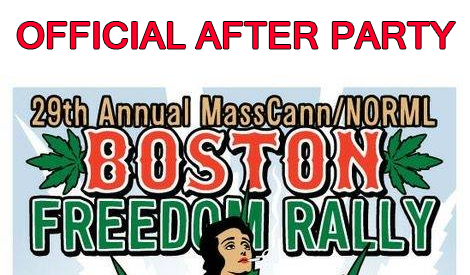 This will be the Premiere Boston Freedom Rally After Party Event! Capacity is limited, so sign up today! Celebrities in attendance to be announced soon! Attendance to the afterparty is FREE! The enhanced VIP experience includes access to the VIP area, watching the Patriots game with Eric and friends, CBD infused treats, a commemorative event gift, VIP gift bags, photo opportunities with Eric and his Super Bowl ring, and more! Educational tracts will be announced soon! The event will present an Educational Pavillion around the science, social impliactions, and health and wellness of medicinal cannabis. Come and learn how and why legal cannabis is improving lives, fighting opiod addiction and deaths, used in daily health and wellness, and more! We are proud to announce that we will use net proceeds to benefit local Massachusetts based cannabis related charities. Former NFL Super Bowl Champion, Eric Martin will host a social cannabis friendly event. Expected are additional professional athlete appearance(s), educational presentations by legal and medical experts in the cannabis field, free legal cannabis treats in the VIP area, VIP gift bags, food trucks, music and watching the Patriots game while networking, learning and normalizing cannabis. VIPs will include a who's who in the Massachusetts cannabis industry and attendees are expected to be casual cannabis and football fans.